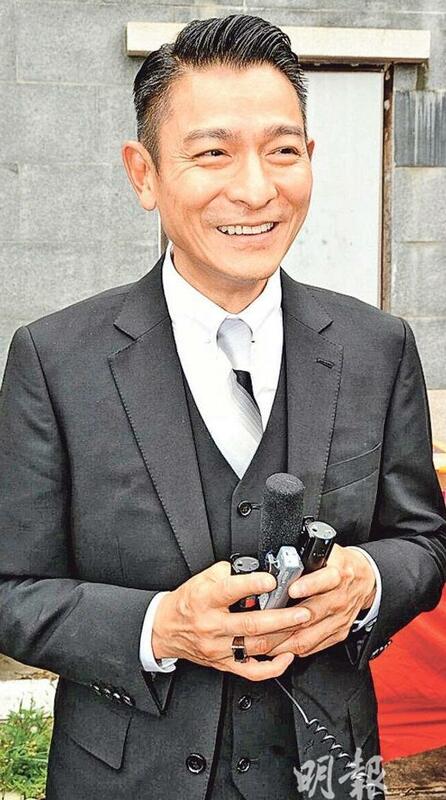 The film KING OF DRUG DEALERS (JUI LUNG) yesterday held a production start ceremony at a Tuen Mun temple. Boss Yu Dong, director Wong Jing, actors Andy Lau Tak Wa, Donnie Yen Chi Tan, Kent Cheng Juk Si, Wilfred Lau Ho Lung, Michelle Hu Yan and Xu Dongdong attended. 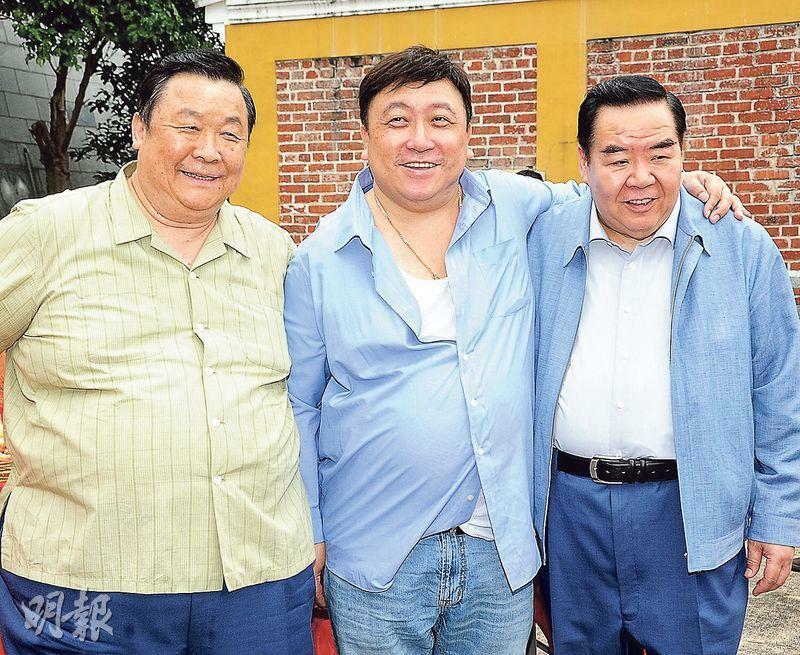 When three "giants" Cheng Juk Si, Wong Jing and Chun Wong posed for a photo together, they almost busted through the camera. Cheng Juk Si could not help but joked, "The three of us together are at least 700 pounds!" Wa Jai was rumored to have secretly become a father again, but he did not respond. Wa Jai after 25 years played Chinese inspector Lui Lok again. 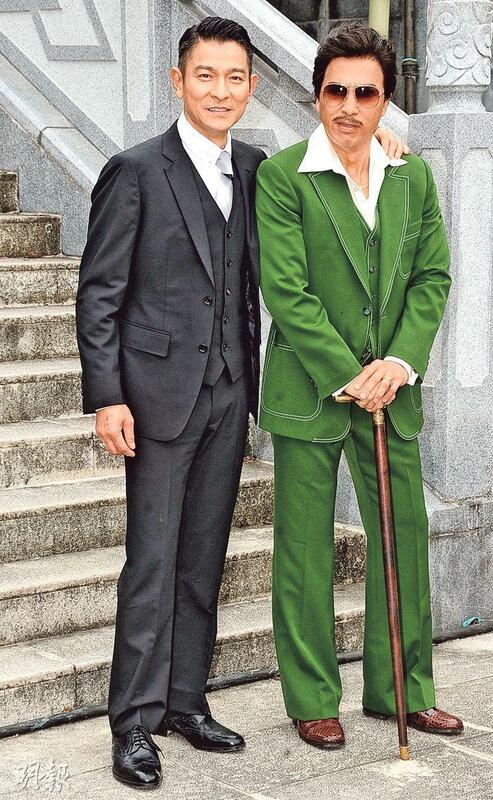 Yesterday he appeared in a suit and "gel hair" look, seemingly he went back in age to play the role? 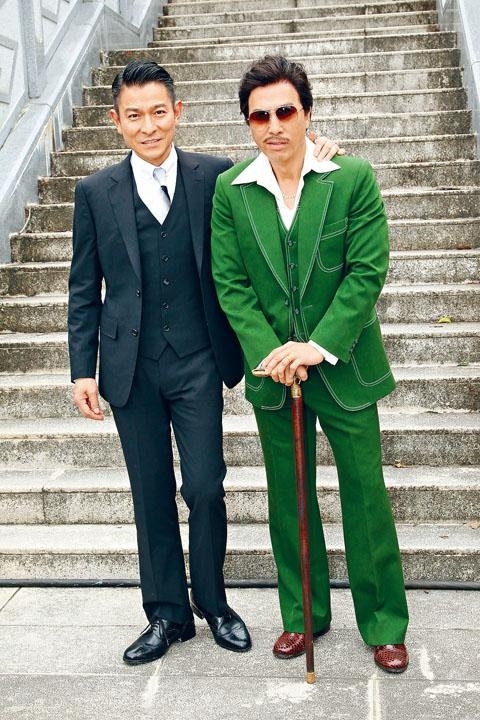 Wa Jai said, "Now I am playing the Chinese inspector who was just promoted in the 60s. I am 50 something, I just celebrated my birthday yesterday!" The 55 year old Wa Jai revealed that on his birthday he celebrated with family and friends at dinner. As for his birthday wish, Wa Jai said, "Staying young!" As for not getting too many gifts this year, Wa Jai said that he received 8 to 10 "karaoke equipment of god". Reporters joked that he could sing with his whole family. He joked, "My family doesn't have 8 to 9 people!" Did he have a new member? He said, "No, I am telling everyone very clearly, once in while such a rumor would appear!" Reportedly his heart ached over his daughter being a media target, so he did not announce the birth of his son? Wa Jai repeatedly said, "No, no, everyone is already showing me a lot of respect. If they want to chase it wouldn't be like this. I am very comfortable at home." What did his little lover (daughter) give him for his birthday? Wa Jai pouted and said, "Nothing this year! Last year I got some Play Doh, this year she only sang the birthday song." Did she blow out the candles of him? He said, "That's right, you seemed to have witnessed it!" Speaking of Wong Jing revealing that both Wa Jai and Chi Tan have high salaries, Wa Jai said, "It has always been pretty high, but it's not as high as others!" Chi Tan's salary was 30 million RMB. Wa Jai said, "Everyone deserves it, the boss measures how much everyone is worth." Wa Jai said that this time he actually was giving a special performance, mainly because it was hard to cast for the role of Lui Lok he agreed to perform. Was he a guest performer? He said, "Not just that, I got paid, in comparison to Lee Rock before the price of course is different." Was he paid for an entire film? He said, "I hope so, ask Wong Jing!" Yen Chi Tan yesterday appeared as Crippled Ho with a cane in his hand. He even said a few lines in the Chouzhou dialect. He said that he has already studied for several months. In the past Ray Lui Leung Wai already gave a classic performance, he did not want to follow but hoped to attract new viewers with a new look. Chi tan in the film had a few fight scenes. He joked when the boss hired him he definitely would not want him to "just talk", even the street fights would have action designs as he did not want the audience to feel "cheated". He and Wa Jai would have a "one on one fight". Did he or Wa Jai win? He said, "Of course Brother Lok wins!" Yet he was the strongest in the universe? Chi Tan said, "You misunderstood the meaning of the strongest. Actors act, the strongest dares to try anything, the strength of courage! However I haven't worked with Wa Jai, this time I am very happy and very honored!" As for his 30 million RMB rumored salary, he avoided the topic. "It's meaningless to talk about money, don't talk about how much!" Brother Jing joked that after paying the salary he almost had no money to eat. Chi Tan said, "Mr. Lau is more expensive, people like me just have fun. He has always been more expensive than me. I don't charge a lot." Wong Jing revealed that KING OF DRUG DEALERS reached 200 million RMB in investment. Aside from Wa Jai and Chi Tan's high salaries, the film also had to build Kowloon Walled City and Lai Chi Kok Amusement Park sets. He also revealed that he asked Philip Ng Won Lung, Tong Chun Yip and Niki Chow Lai Kei to guest star. The film has not confirmed a release date as it will mainly aim for film festivals first.